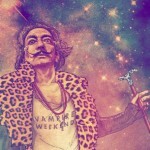 What does your t-shirt say about you ? Every husband has understood that happy wife is equal to happy life. One just needs to keep his wife happy, and every thing else just follows. February 14th is being awaited early by wives, and they not just expect a gift from her husband, but lot so many promises have to be made. Valentines day calls for special attention, romantic talks, dinner date, movie night and what not. And after all these, – the valentine gift. So dear husbands, don’t be confused on what to gift and what not to gift. We present you an extensive list of gifts that can be given to your wife on Valentine’s Day. 2. Personalized Photo Canvas with Message : A perfect gift to place in your living room. You and your wife’s selfie or photograph, with a beautiful message which makes her blush every time she reads it out loud. 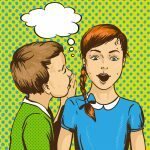 And make this a rule, to spice up your life, that every day, husband has to read out the message aloud. 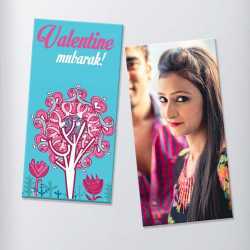 Canvas are long lasting, and this personalized gift for wife on valentine will be a gift for ever. 3. 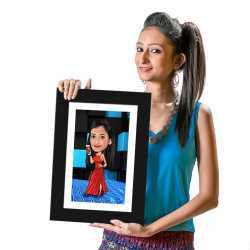 Caricature Wall Hanging : Can you imagine this wonderful gift even exists! Yes, the faces will be personalized. It will be you and your wife, playing like this, saying – “I am the boss”. These are bit expensive but that is quite understood. The caricatures are hand drawn by professional artists, based on the photographs. You can also suggest revisions after the artwork is done. Your wife can’t help but hug you when she gets this gift on valentine’s day. 5. Caricature T-shirt for Couples : A pair of t-shirt, for you and your wife. Its quite cliche, but it reflects the bonding you two share. 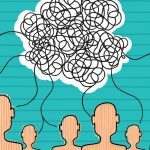 It will make you feel even more connected. 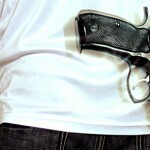 Friends and family will surely notice, and everyone will love to see you too in these t-shirts. And its personalized with your own faces caricatured. What else you could ask for. Its the one perfect gift that your wife would love to receive this valentine’s day. 6. 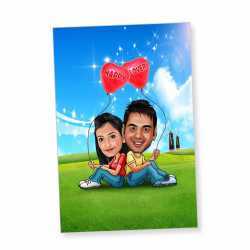 Caricature Wall Hanging : You will fall in love with caricature products. Yet another caricature gift for your wife on valentines day. 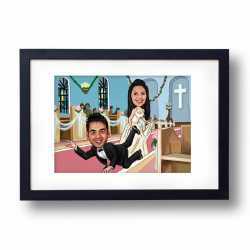 Its a framed caricature, with a beautiful theme. The size of these frames are A3, and will look good as wall hangings. They will be little big to be kept on table tops. Variety of themes are available, and you could choose the one, which fits your wife the best. Your wife is sure to be taken aback (positively) by receiving this wonderful gift. 7. Caricature Chumbak : Yes, this is what these cute little fridge magnets are called. The faces you see are personalized, and hand drawn by artist by looking at your photos. Amazing, isn’t it! Now these fun fridge magnets are available online (at a good cost of course) but really worth it. Gift it your wife this valentines, along with giving her a lovely dinner treat outside. Many more themes and templates are available. Some of them are funny, some romantic and some of them just mind blowing. 8. 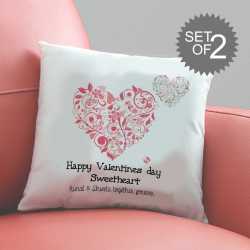 Soft Personalized Cushions : If your wife loves soft toys and stuffs, this is a perfect gift for her on valentine’s day. Now that she isn’t a girl anymore, and a grow up, she could well be happy with this Valentines’ day cushion. As it says – Happy Valentine’s day sweetheart, you are sure to impress her. Make her feel loved and cared. Personalized gifts always help in doing that. The effort reflects and it rewards directly or indirectly. Set her mood up this Valentine’s day by gifting her this romantic cushion. READ Have you Surprised your Father? 9. 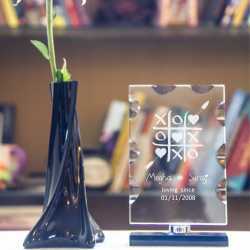 Love Tic Tac To Engravings : Such a cute and lovely gift for your wife by dezains.com. Especially designed for the occassion like anniversary or Valentine’s Day. Get your and your wife’s name and message engraved on this chipped stylish rectangular crystal and gift your wife a show piece, a memento and a souvernier of eternal love. 10. Hand drawn pencil sketch by professional artist : Although your wife would love to have a sketch of her drawn by her husband, but its not always possible for everyone to be artistic. For those who are not an artist themselves, can try out this gift product. A pencil sketch, real hand drawn on canvas or wall hanging frames. 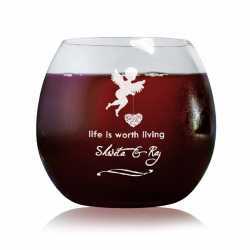 It could be a classy gift product and can be put in your living room, which will add to the elegance around.